The 10 Year Treasury Note contract is one of the most liquid futures contracts that currently exists. Similar to the E-mini S&P 500 contract, large market participants are able to execute huge positions on a daily basis with no issue of liquidity and/or slippage. Here is a screenshot from the CME Group's website, section Interest Rates (Close of January 29, 2015). 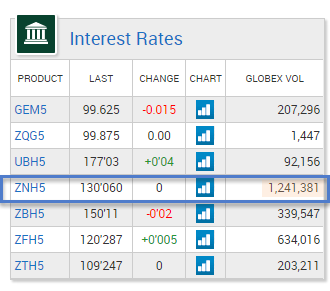 As we can see, the ZNH5 (10-Year T-Note March 2015) has with 1,241,381 the most Globex volume, followed by ZFH5 (5-Year T-Note March 2015) with a Gobex volume of 634,016 for today. 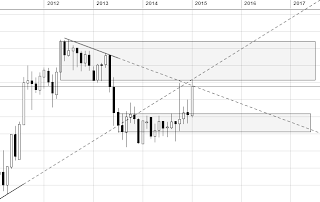 Anyway, here's a top down perspective of the Notes filtered through three plain bar timeframes: monthly, weekly and daily. As usual we start out with the monthly bars chart. The first thing to note is that this market pushed above the balance area that occured since several months (more than a year). Actually there has been two attempts to break lower but the market got back into the bracket area. Now we broke out above the balance area to test our bullish and bearish trendline as well as the bottom of a previous bracket area. So far the market rejected this bracket low to the tick. 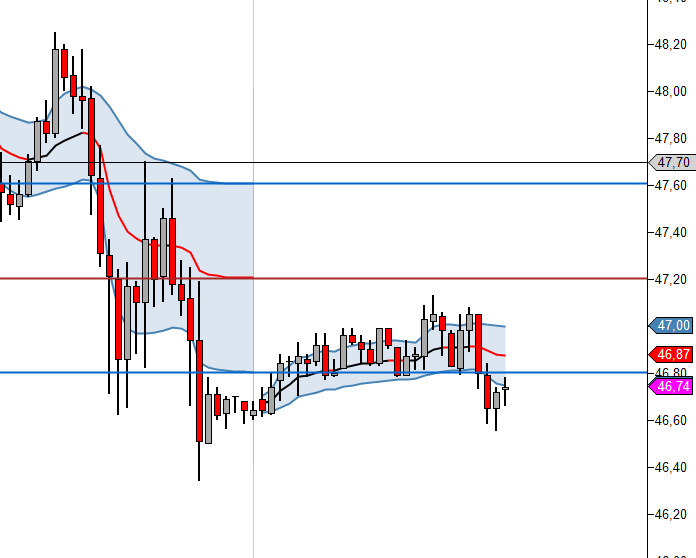 Also, this balance area low is confluent with the 61.8% Fibanocci level. We'll see what the market will do here. 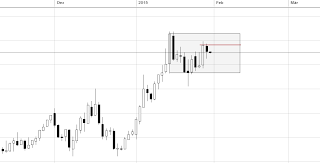 Looking at the weekly bars chart, we can observe a one time framing higher market that occurs since four weeks. The previous week was as the current week an inside bar. 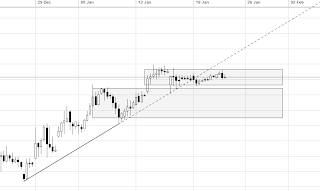 Since three weeks the market rejecting this resistance area here. A break above should continue the one time framing behavior to the upside. 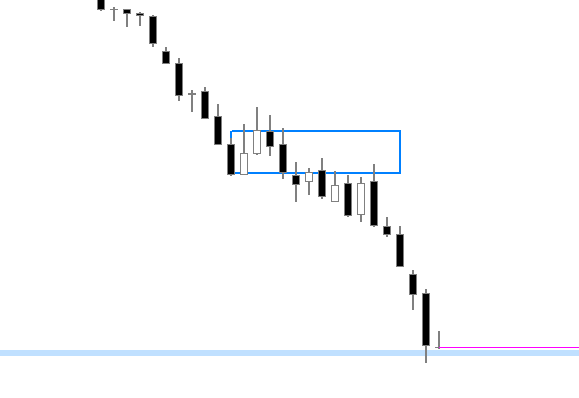 Moving forward to the daily bars perspective, we can cleary see the balanced condition in this market currently. Inside of this balance area the market is one time framing higher for a possible test of the bracket high. However, with today's inside day the market formed a potential resistance level. With installed EMAs we can see that the bullish short-term trend as well as the long-term tred on this timeframe is intact. 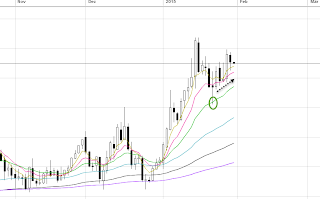 Several days ago the 20EMA served as nice support and followed by continues support at 10EMA. 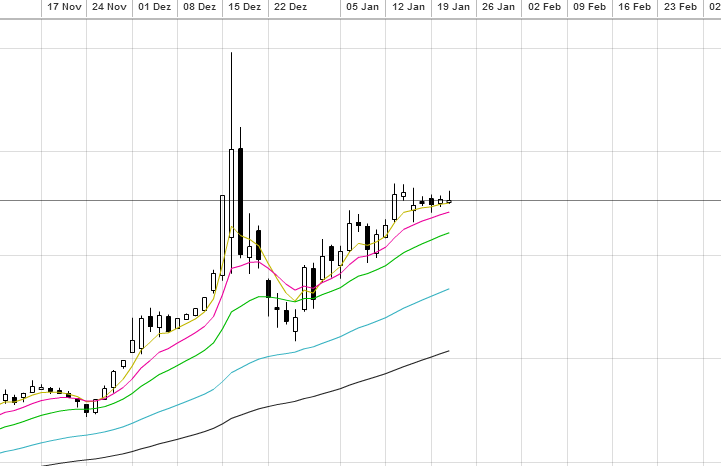 Today the market actually rotated back to this week's average (5EMA) and found support. 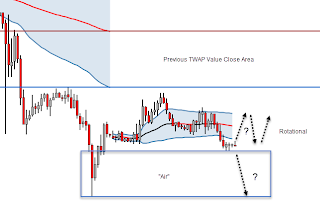 We would like to elaborate this analysis with VWAPs but this would be too much informations here, so take a look into our community and eduction sections to learn more about our VWAP analysis process as well as other tools we use in our analysis and trading approach. 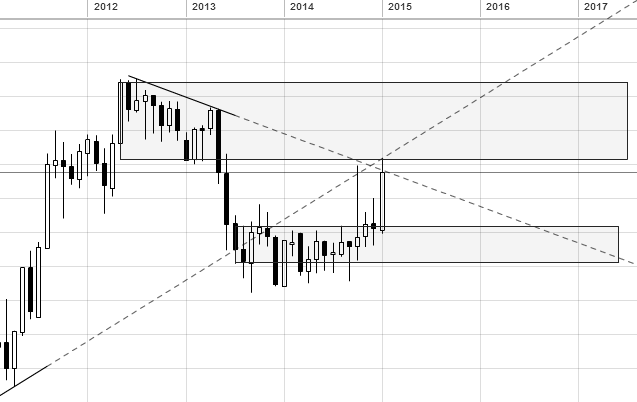 Because of the heavy move in EUR/CHF we should consider a technical look into this market, out of curiosity and diversity. As it was a substantial knee-jerk move we will start out with the macro Yearly bars chart. With looking at this macro chart, we can see that the market actually one time framing lower since 2008. 2009 was a calm inside year followed by the 2010 drop and the buying tail year 2011. After three years of "balance" and inside bars the market continues its one time framing lower behavior with a smashing Thursday (15th January 2015) and a new low below 1.0000. 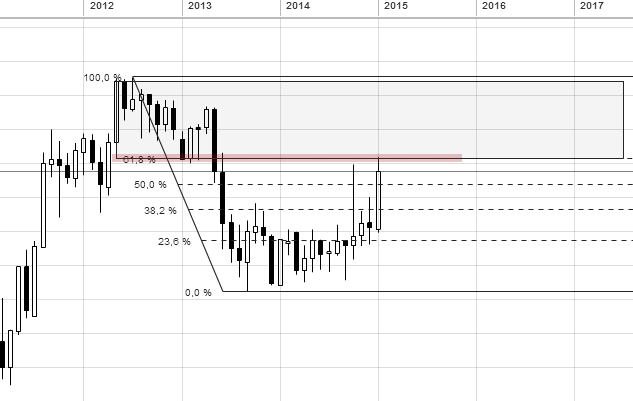 The monthly bars chart presents the same knocked down picture and we can see the potential break of one support level. Looking at the daily perspective, we can observe some more interesting things. 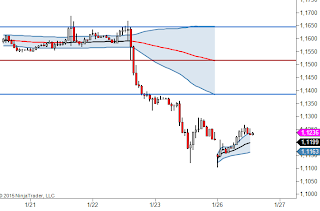 We can identify a balance area and with the installed Fibanocci tool we can observe a potential area which could be rejected. 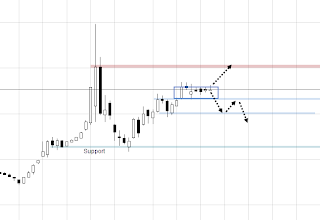 Possible is a move back to the bracket low as well as a move towards to the 61.8% level. Easily one of the most informative forums on trading available. The content is comprehensive and provides a very detailed structure on which in depth futures market analysis can be formulated. Now while the forum does focus mainly on Auction Market Theory, one does not need to strictly adhere to AMT to appreciate what is being given away here. Simply put, the quantity and quality of information available at The Private Banker is first class. Thank you for your kind words Jamie! On the other hand when Canada or Norway, both net oil exporters, convert their oil sales revenue from USD to their currencies the price of Brent crude in Canadian dollars or Norwegian kroner has fallen only 49% and 46%, since July. Here is the post from EIA with more details. The Crude Oil (CLH5) weekly educational market report for the Close of Januray 23, 2015 has been posted on our trading community. You will have access to view this educational report with an elite membership. It cover a weekly summary, analysis and potential scenarious as well as market related market news. We have to point out that this report is simply an educational observation of the market and is not to be construed as investment or trading advice. Twap is an abbreviation for the Time Weighted Average Price. This is just like VWAP only it is weighted upon time. This is also an order type that many institutional investors utilize to work in and out of significant positions. It behaves like an Iceberg order by only showing a certain amount of orders to be executed but continues to refresh the orders throughout the session until the position is complete. With this informaiton in our mind let's going through the monthly, weekly and intra-day TWAPs. Make sure to have time based charts as this is a Time based tool. However, this is our logical preference but you can playing around with whatever other chart formats as well. The Forex market is a 24 hours market, so there is no point in using a 'London Session', 'U.S. Session' or name them all. With that said, all charts here are ETH/Globex based and representing the march futures contract (6E). Like always it is your free choice in which way you will use this tool. As usual, we beginning with the monthly TWAP. 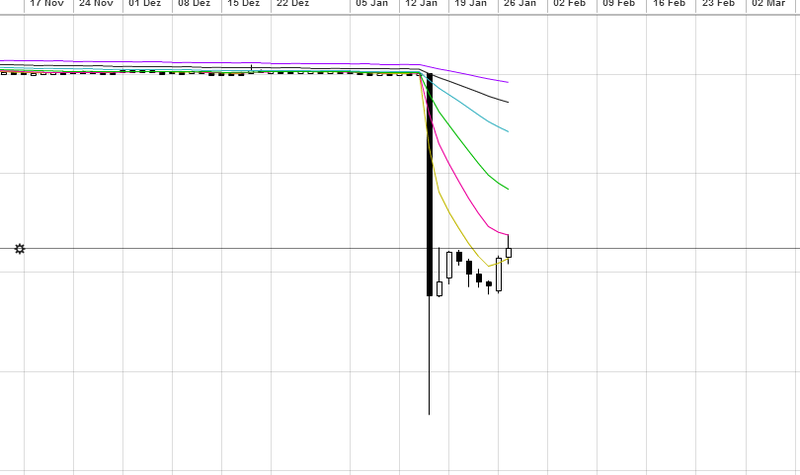 Looking at this installed tool, we can see a cleary selling imbalance with the developing value slope to the downward. 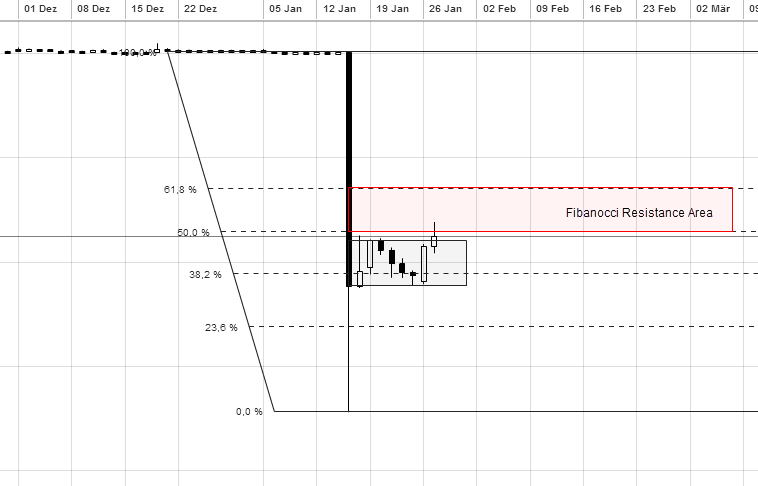 The market opened below the previous month's value close area and since that point it rejects the developing value low. In summary a very bearish rated view here. Moving forward to the weekly TWAP, we can observe an open below the previous week's value close area with a developing value slope to the upward. 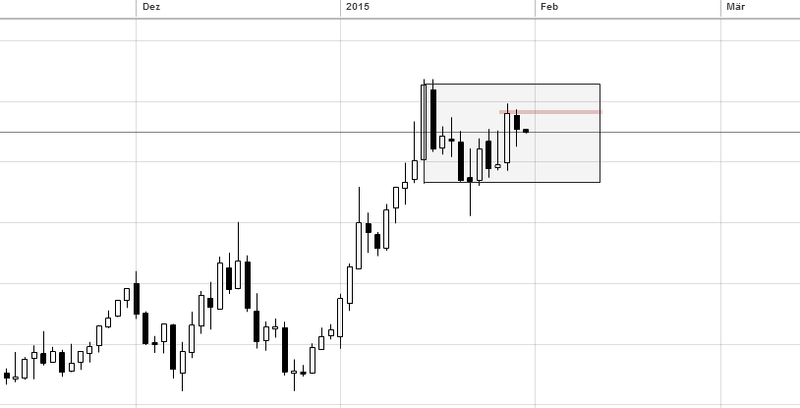 Additionally the market is trading in a balanced behavior, so a break above should lead us to the previous week's VAL close level but we should be very careful to take any long trades with the bearish HTF macro perspective, especially with the strong US Dollar index. Anyway, everything can happen and we should have an open mind for potential changes in the market context. 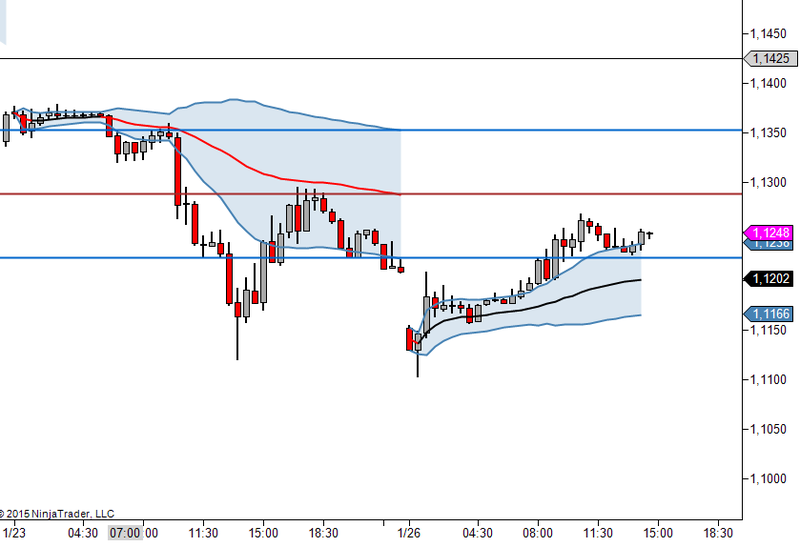 Now looking at the intra-day VWAP, we can see an open below Friday's value close area and a developing value slope to the upward. 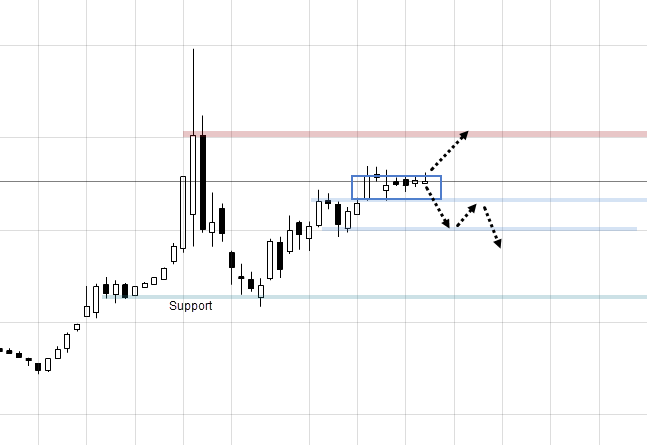 Currently we got back into the previous value area and trading above the developing value. 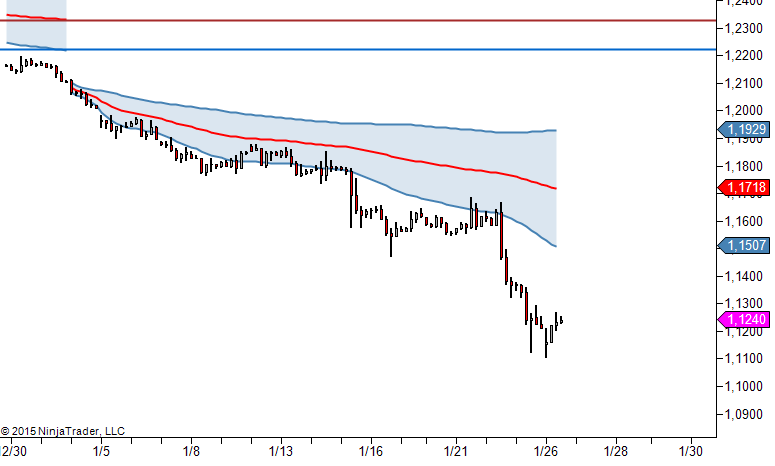 Test of the previous TWAP close level as well as a rotational move back to the developing value low are possible scenarios. We'll see what will happen here. For more informations about our Trade Methodology and our Top Down process we refer to create an account on our trading community. You can join for free or support the community with an elite membership. With this membership level you will have access to chart templates, trading journals and a huge wealth of informations about various trading focused subjects. We hope to see you soon. 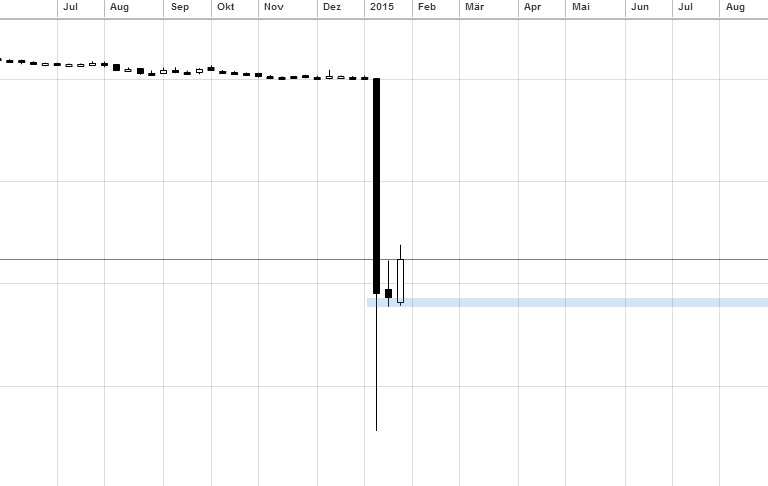 In the meanwhile let's take a technical look at the Russian Ruble again. With looking directly at the weekly bars chart, we can see that the market broke the potential balance area to the upside and one time framing higher since 3 weeks. The current week is a rotational inside week. 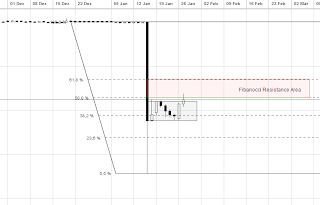 We can also identify a potential resistance area between the 50% and 61.8% fibanocci levels. 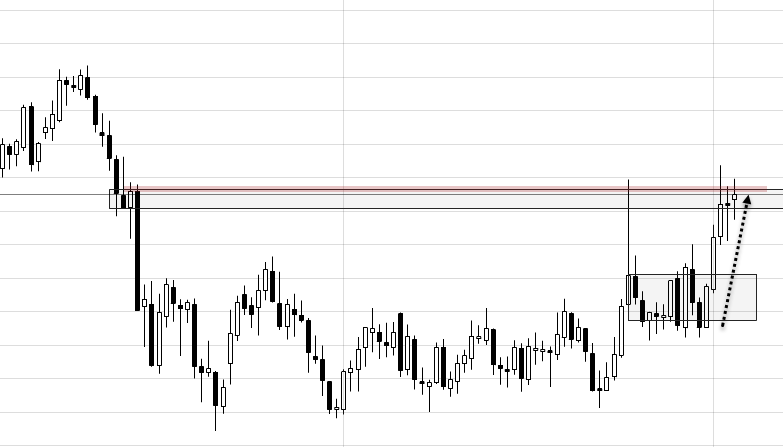 Currently the market rejecting the 50% level and balancing around below that area. 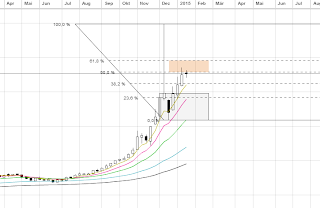 With the installed EMAs we can cleary see that the bullish short-term as well as long-term trend is intact. Moving forward to the daily bars perspective, we can observe with installed EMAs an intact bullish short-term and long-term trend as well. The 10EMA served as support on several days. 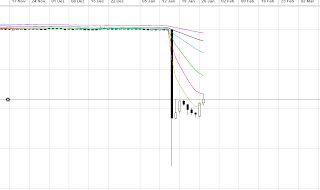 Since five days the market trading in a balance behavior and rejecting the bracket high. 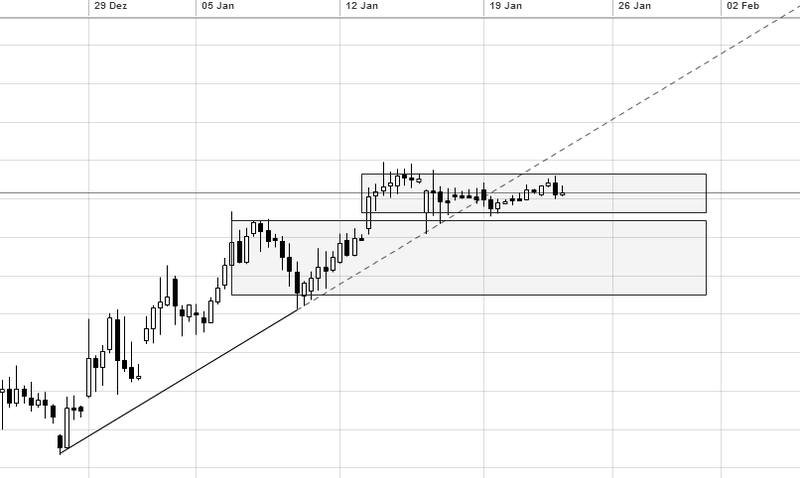 In the next days one of the potential scenarios could be a test of the lower balance area and the next support level. 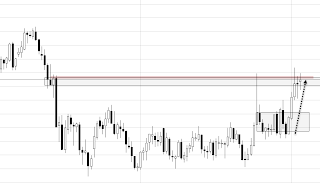 A break above the balance area to test the next resistance level is porbable as well. We should also consider a closer look with the 240 minute chart. With this timeframe we can identify two balance areas and a break of the bullish trendline that strengthens our conclusion of a move to the balance area low and maybe lower. It is interesting to see how the market react to these balance levels. 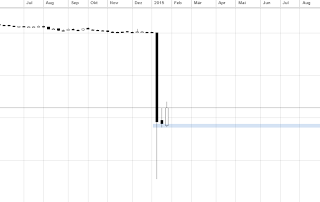 Since our last post the value of the Russian Ruble has worsened. Anyway, there are good technical signs to move this market lower but like usual: everything can happen! 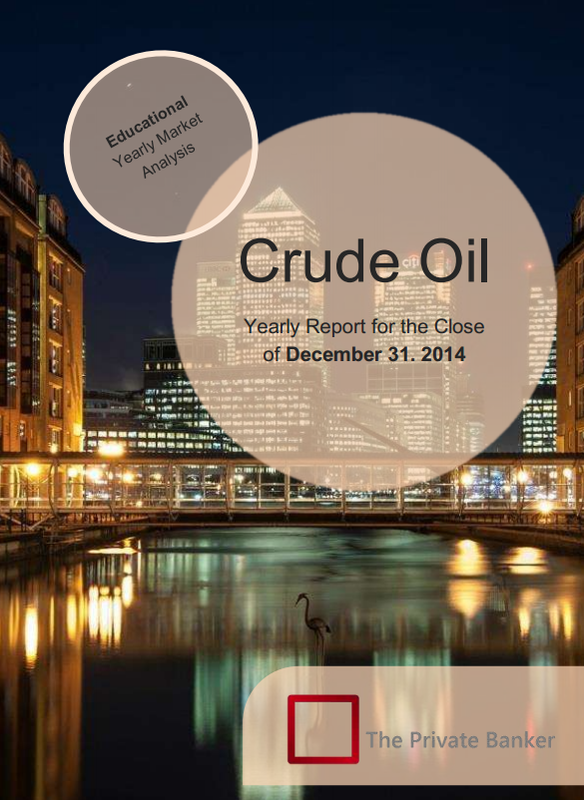 We hope you got already a chance to take a look into our Crude Oil educational Yearly market report for the close of December 31, 2014. With an elite membership you will have easy access to that educational report as well as for the upcoming reports. The educational reports give you an overview of our top down process in use with various tools on a specific market alongside with thoughts about several potential scenarios. The idea is to show you our understanding to find the path of least resistance in "realtime" for a current market combined with potential scenarious to simplify and speed up your learning curve. Please note that you will have the most benefit paired with the premium educational sections. 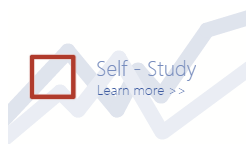 To keep things organized we are posting all our educational reports in one locked thread on our trading community. Currently all reports are free for community members with an elite membership. 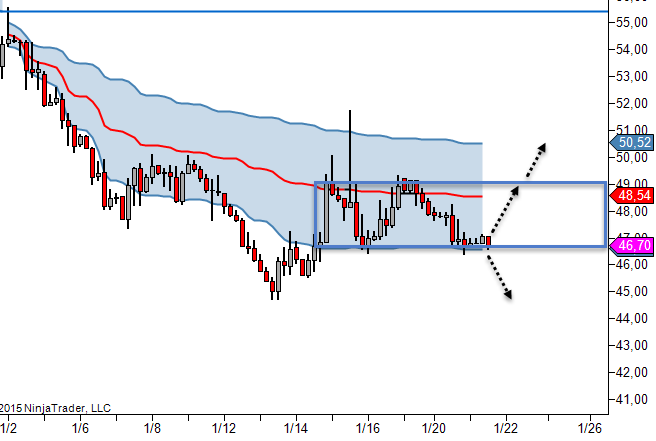 Here's a quick VWAP perspective what we are seeing with Crude Oil currently. 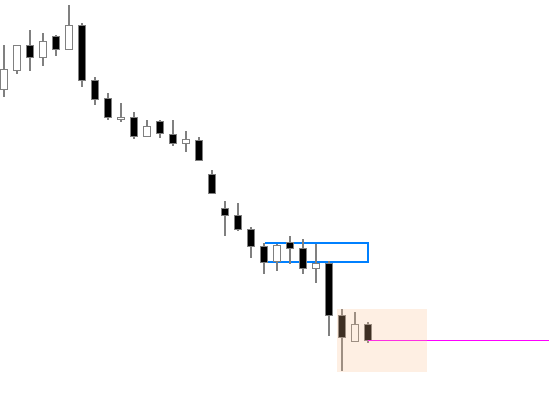 Beginning with the monthly VWAP, we can see that the market is sitting on the monthly developing value low confluent with the current balance area low as well. 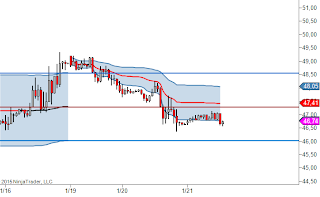 The market is selling imbalanced since the market rejected the previous month's VAL close level. As the market got back into value again a rotational move back to the bracket high and developing value high is probable. Anyway, a break and testing lower prices is possible as well. 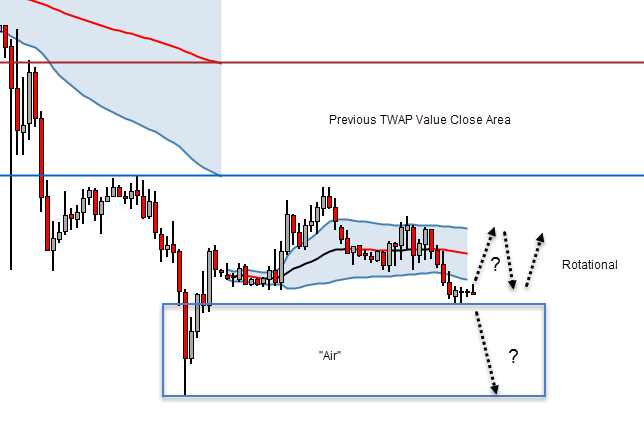 Moving forward to the weekly VWAP, we can cleary see a sell imbalance inside of the previous week's value close area. The market is trading around the weekly developing value low. We will see if a test of the previous VAL close level is possible today. 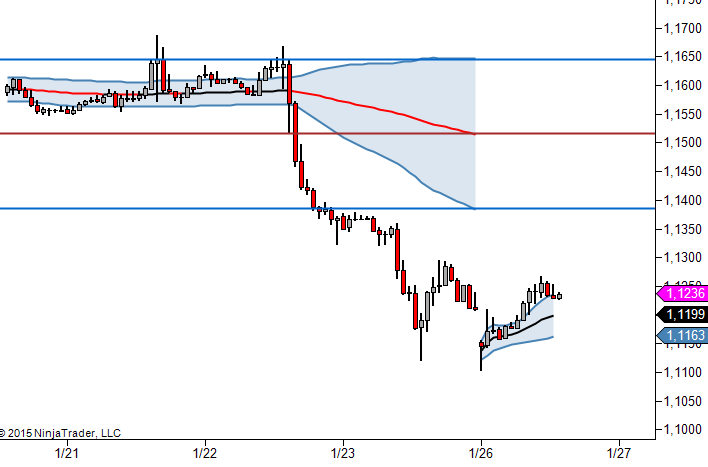 With looking at the intra-day VWAP, we can see a Globex open below the previous value close area. 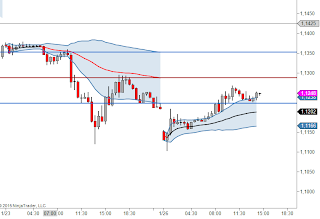 The developing value slope is somewhat to the upside and as the ON-Session got back into the previous VWAP value area. Currently we are trading below the developing value as well as the previous value close area. Let's see how the market will react to the DVAL here. 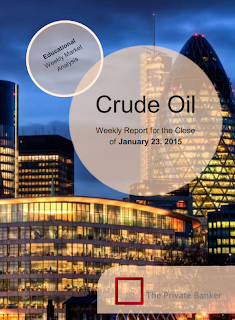 The Crude Oil Inventories will be out tomorrow because of Monday's holiday. This was only a brief look with the tool VWAP that we using in our daily trading to read and better understand the current market context. If you would like to learn more about our trading approach feel free to visit our trading community. Here is a quick market update for EUR/USD. As always, we will looking for the path of least resistance with our top down analysis process. It is the most significant part in our daily trading to read and understand the market story with various tools on several timeframes. With that said, let's start out with the monthly bars chart. With looking on the monthly chart, we can still see the major one time framing lower market that occurs since eight months. Also the previous month's low got taken out immediately to moving lower and lower. Currently the market testing a potential support area. The market participants awaiting Thursday's ECB decision about the QE program, so it will be very interesting to observe the market behavior here. 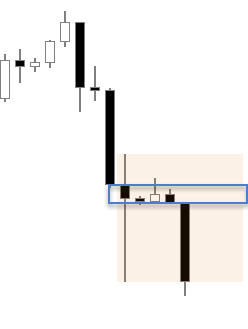 Moving forward to the weekly chart, we can see the market rejected several times the balance area low to finally continue its one time framing lower behavior here as well. 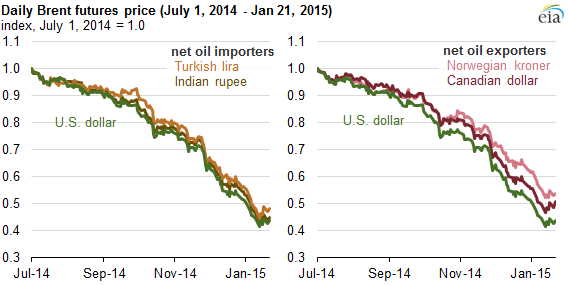 Currently we have a rotational inside week as the market did not took out the previous week's high or low. We can also identify that the previous week closed above the marked support level. 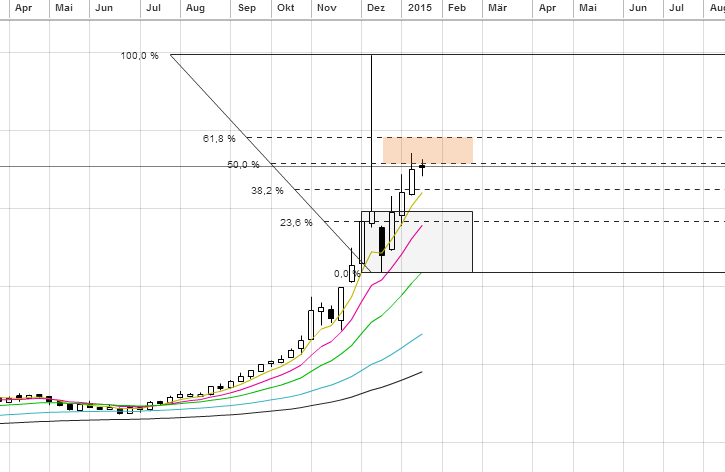 As we are analyze the weekly bars chart we should also consider a look on the weekly TWAP. The market opened below the previous weeky value close area. The developing value slope is somewhat flat and we can cleary see the rotational behavior. However, we are trading below the weekly developing value and there is enough room to the downside. 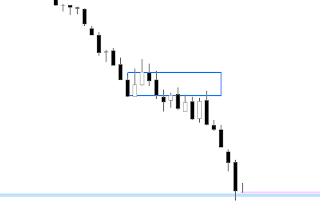 With looking at the daily bars chart, we can observe a one time framing lower behavior and two inside days. As mentioned before the market participants awaiting Thursday's decision, so we should expect one more rotational inside day before the market get really wild. If you wish to learn more about our Trade Methodology please visit our website. You can also use our free Trading Glossary if you do not understand some terms that we use in our posts. Be careful and stay open minded as well as happy! 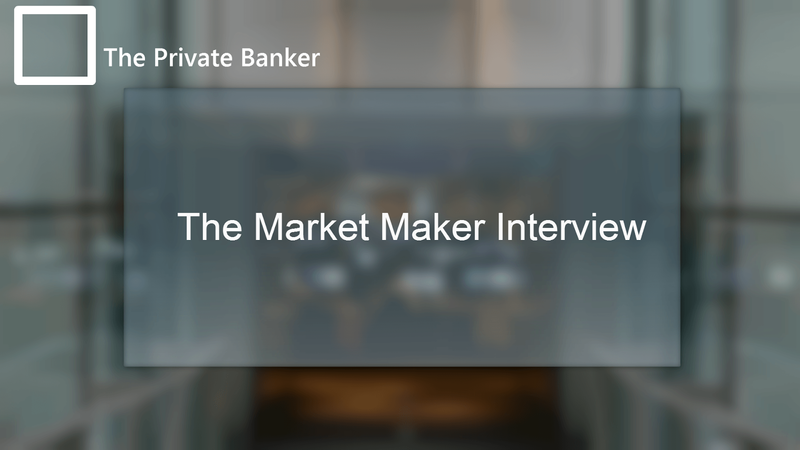 It was our pleasure to welcome Adam Webb (@adamwebb_uk) for an interview webinar on the subject "Market Maker". The live webinar was held on Friday the 9th January and we got several positive feedbacks about the interview. 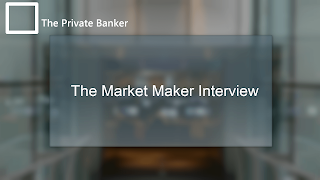 We are glad to recorded this interview and made it available for all elite members on our trading community.